It is hard to pick a sample of this years poetry slam since so many of our students did such an outstanding job of writing and performing their poetry. The young poet in the video exemplifies the flavor and talent that our students exhibited in the nine virtual slams we had last week. 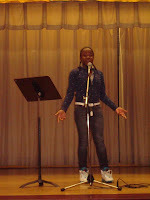 The culmination of slam was an "Open Mic" which gave our young poets a chance to perform in front of their peers "live". The Poetry Slam program which I have been involved with for five years is a poetry writing and performance residency that takes place in the classroom over a ten week period. During this residency a slam team is chosen. The slam team consists of 5 members and 2 alternates. This team then goes on to slam using videoconferencing technology. The competition is with other schools. This year our teams slammed with other students in Queens and the Bronx. Two of NYC five boroughs. This program has expanded to other cities as well. Chicago has a Poetry Slam program. To learn more about the program go to Globalwrites. For the past three years I was able to fund this program through a generous New York State Learning Technology Grant. I wrote the grant for three schools. The middle school where I work as a technology coordinator, another middle school in my district and a Catholic School. One of the grant requirements was to have a non public partner. The idea behind the grant was to follow classes from 6th grade through 8th grade and to see how their poetry developed. This was the last of the three years. Most of the students were now 8th graders and they had been writing and performing poetry for three years. It is wonderful to see the student develop their poetry and performance over the years. To see students who are shy find their voice and build their confidence. Over the years that I have been involved with poetry slams I have seen teachers and schools continue poetry slams even when there was no money to pay a residency. The program is just that rewarding. This year I added an ASK style videoconference with a Kahlil Almustafa, a poet and author who wrote a book of poetry called "Growing Up Hip Hop". I blogged about it in my previous post. Also, this year our some of our students performed for the community at the Queens Botanical Gardens. As much as I love the technology of videoconferencing our poetry through slams, I also love the different ways our students have gotten to share their poetry. 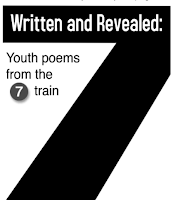 In fact this year we printed all our students poems in an anthology "Written and Revealed: Youth poems from the 7 train". That is the subway train that connects our schools. A common thread among many that our young poets share. Today we had a videoconference with Kahlil Almustafa, poet and author of "Growing Up Hip Hop". I have worked with Kahlil for the past 5 years in our Poetry Slam program. He is not only a gifted poet and performer but he is an amazing teacher. The relationship that Kahlil has with the students is truly inspiring. The students light up when he enters the classroom and the poetry they write reflects this extraordinary teacher student connection. As part of a grant I invited Kahlil to host an ASK format videoconference. ASK which stands for Authors, Specialists, Knowledge brings authors and experts to answer student questions based on the books they have read. The student had just finished reading Kahlil's first book of poetry "Growing Up Hip Hop". This is why Kahlil came to our school today to share some of his poetry and answer the students questions about his poetry, life as an artist and tips on how to perform poetry in a poetry slam. Kahlil's visit was actually two part. At first he visited some of the classes in the flesh. He performed some of his poems, fielded questions and warmed up for the videoconference that would take place later on. By the time the videoconference started he was all warmed up and ready to go. 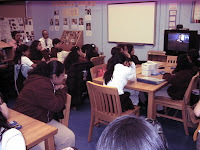 The videoconference was with three of our Poetry Slam classes. These classes have been working with other artists as part of a ten week poetry residency. In two weeks they will be performing in a poetry slam so Kahlil's videoconference was very helpful and timely. When the videoconference began some of the students looked bored and detached but Kahlil's personality and style soon got the students involved and excited. Kahlil stood close to the monitor at times he even touched the screen. When students asked questions about specific poems, Kahlil performed the poems so everyone was familiar with the poem. When he was asked what inspired him to write poetry he told them about discovering "The Collected Poems of Langston Hughes" at his "fake cousin's" house when he was 15. (According to Kahlil everyone has a "fake cousin"), Every answer to ever question was thoughtful and often flavored with humour. Kahlil also gave advice to our aspiring poets on writing and performance. With regard to the latter he told the students when they practice their poems they should do whatever comes naturally to them but they should pay attention to gestures and deliveries that they like and then purposefully incorporate them into their performance. Kahlil Almustafa is a treasure and because of that the videoconference today was very special. I will be blogging about our 2009 Poetry Slam very soon but as an off shoot of Kahlil's work with our students our schools will be participating in the Queens Art Express event at Queens Botanical Gardens. This is a great opportunity for our student poets to join Kahlil in performing their wonderful poetry. Now that my first attempt at coordinating an ASK format videoconference is one for the books, or more appropriately blogs, I'd like to reflect on the experience and on the extraordinary videoconference. The day began with my losing my cellphone. I would soon retrieve it but I was a little uneasy that it might be a portent of what was to come. Next I received a call from one of our participating schools. It was the one in Nova Scotia, Canada and I was very excited about this school's involvement since our author Virginia Frances Schwartz was born and raised in Ontario Canada. I would learn in this conversation that they would be audio only and that they were not sure if they would be able to connect as they had some problems during the test call the previous week. My spirit sunk a little bit when I realized we wouldn't see the students and possibly may not even hear them. What next? 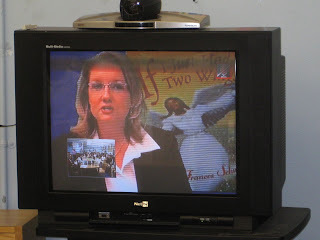 I was even nervous about my own equipment which worked perfectly for the Dr. Ben Carson ASK videoconference on Monday but is sometimes at the whim of how much traffic is out there in cyberspace as we connect using a commercial cable modem with a dynamic IP. So, by 11:00, the videoconference was at 12:00, I was so relieved and happy to see the author arrive and realize that it was almost showtime. At 11:30, the 6th grade class at my school, arrived at the Media Center. They had the book and their questions in hand. I seated the students who would be asking the questions at the table with the author as the rest of the class of 29 filled up the other 3 tables. I quickly prepped them for the videoconference. I told them not only were they special to have the author in the room with them but they also had had a special responsibility to be really quiet when the author was talking. Then it was time to dial into the bridge. To my great relief a class was already there as well as Roxanne Glaser, from Waco Texas, who would be facilitating the videoconference. One by one the other schools connected to the bridge and we were ready to begin. Roxanne called the schools by alphabetical order. First up was Chester Middle School in Nova Scotia, Canada. Their sweet strong voices were music to my ears. 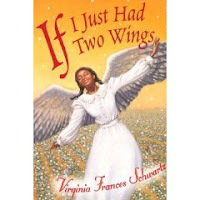 Then one by one students in Minerva, Ohio, Monroe Township, New Jersey, Lynbrook, New York, and the two New York City schools took their turns to ask questions to author Virginia Frances Schwartz. The students questions were wonderful. Sometimes they would refer to specific pages in the book. Other times their questions were more broad. "Why did you write a book about slavery and the Underground Railroad?" Ms. Schwartz had two answers for that question, One as a classroom teacher, she was teaching kids about slavery and the children were yawning all the way through the lessons. She couldn't find any good historical fiction books about that time in American history. So, she decided to write one herself. The other reason is that where she grew up in Ontario, Canada she lived near depots that were used in the underground railroad. So a combination of experiences in her life and her love for writing led her to write two books about slavery. She feels she may write one more about the lives the slaves now free men and women lived in Canada. Another fun part of the videoconference was our lightning round. With just about seven minutes left, Ms. Schwartz answered a full round of questions in less than six minutes. This left just enough time for the students to give her an enthusiastic round of applause. 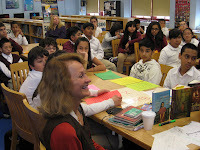 I just want to thank the teachers and students at the six participating schools, Roxanne Glaser for her fantastic facilitation, Ra at the New York Institute of Technology for bridging the calls and our amazing author Virginia Frances Schwartz. My hopes in my previous blog for this my first attempt at "producing" an ASK videoconference were that everyone shows up. That the technology works. That everyone involved enjoys participating in the program. It looks like those hopes were realized above and beyond my expectations. Watch for ASK #2! I am one week away from my first ASK format videoconference that I am producing. It is exciting and at the same time a little bit scary. Last year I tried to do this same videoconference without success. I have a colleague who's wife is an author of young adult books. They are mostly historical fiction dealing with Slavery and the Underground Railroad. Last year I purchased a class set of books for one of our 7th grade ELA classes. I posted the videoconference on the Polycom Special Events website and sat back to watch the magic happen. After a few months and postponing the date from February to April, I had no takers except for the class at my school. I finally had to cancel the program. I was disappointed but not deterred and this year I tried again with much better success. I posted the ad on the ED1VIDCONF Digest. Enthusiastic educators with questions about the program started filling up my mailbox. After many e-mails back and forth I had five registered classes in addition to the one at my school. One class is from Nova Scotia, Canada. This class I am especially excited about because the author is from Canada and parts of the story take place there. The other classes are from Ohio, New Jersey and Long Island, New York. 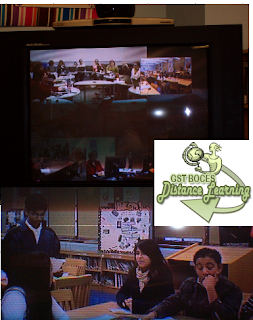 I always feel that when students see students from other places that in itself is a videoconference! It is not easy coordinating a multipoint videoconference especially when you don't have a bridge yourself. However, I am fortunate to have access to the bridge at the New York Institute of Technology. I have used them for our Poetry Slams. This Thursday, we will be doing our tests with the bridge. On Wednesday, February 11th at 12:00 EST it is "Showtime". I will blog about the program more fully then. Right now I am hoping that everyone shows up. That the technology works. That everyone involved enjoys participating in the program. I have planned 3 more ASK format videoconferences after this one but right now I am looking forward to #1. The second task of sharing three things that I believe about all students wasn't as simple. First of all I want to say that Janine Lim took all the best answers. I also feel I would like to relate this to videoconferencing. So, I will try my best at adding to the already great answers and putting on my own videoconferencing spin. 1. Students learn best when they have can have a first hand or hands-on experience. 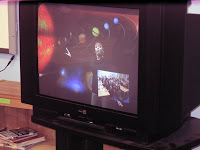 Videoconferencing gives students the opportunity to experience things in a way that traditional classroom learning does not offer. If they can't go on a real field trip a videoconference is the next best thing. Speaking with authors and experts make for lasting experiences. 2. Most students like all people are social animals. They like to interact with each other. They like to work in pairs or groups. Videoconferencing offers an opportunity for this interactivity. When students get to share with students from other places they are very excited and motivated. 3. Students like to be rewarded for their effort. These rewards can be extrinsic or intrinsic. When the presenter or expert during a videoconference says "great question" or "terrific answer" students react with pride and self confidence. Here’s who I’m tagging for this meme. You’re it! Roxanne, Amy and Paul H.
Read Martha’s original post from the Opening Digital Doors blog. Reflect on your thoughts in your blog. Be sure to link to this post and to where you were first tagged. Today for the second time I presented our Poetry Slam program to several school districts that are part of BOCES Greater Southern Tier. The Greater Southern Tier (GST) is a large region in New York State. The Empire State Conference was organized by the GST Distance Learning Service. Their mission is to provide their districts with the support and training required to locate appropriate educational video conferencing opportunities, plan implementation strategies, and support integration of distance learning across the curriculum. I truly enjoy sharing my knowledge and experience with Poetry Slam. I think it is one of the most exciting and rewarding uses of videoconferencing. In our Queens district this program has impacted hundreds of student and as part of the Globalwrites network the numbers now are well into the thousands. I have blogged about poetry slam many times and hope to continue to blog about it in the future. Today was about sharing with other educators. I invited 5 members of one of last years poetry slam teams. They are part of a three year NYS Learning Technology Grant. As 6th graders they began a poetry residency that they continued last year as 7th graders and again this year as 8th gaders. There are 7 classes in all. The grant will evaluate how these students improved in their ELA scores compared to other similiar classes that did not participate in poetry slam. Today the students shared their poems and then fielded questions from the educators at the different sites. They were asked questions like: Do they think poetry has improved their writing in other areas? Will they continue to write poems after the program is over? Are the poetry slam competitions fierce or friendly? What is makes them more nervous performing a poem in front of their classmates or over a videoconference? They answered these questions and more with honesty and thoughtfulness that the adult audience recognized and complimented them on their maturity. Mostly the answers to these four questions were yes, maybe, friendly and videoconferencing. At the end of the conference I think we might have gained some new competition for future slams. How High Can You Jump on Jupiter? This past summer our principal went to Brazil as a guest of the Brazilian Department of Education. She had the opportunity to visit several schools and to observe their educational programs. This week some principals from Brazil came to our middle school in New York City to take a look at an urban American public school. Since one of our 6th grade classes was participating in a videoconference with NASA I invited the principals to join the class for the videoconference. So the group of principals, their translator and the participating class learned about "Planet Hopping Through Mathematics" one of the many NASA programs offered free to our schools through the NASA Digital Learning Network. It was great. The students measured how high they could jump on earth using a meter stick. 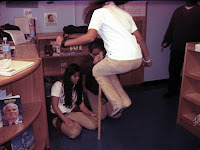 Then through various mathematics formulas they used their calculators to get the jump height on the other planets. Each mathematical calculation was preceded by some interesting facts about the planet they were determining the jump height. The students learned about rings, moons, hurricanes and volcanos on some of the plants. They also got to sharpen math skills like rounding to the nearest hundreth and changing fractions to decimals. Kudos to Karen Ricks our NASA presenter for a program that totally engaged and informed not only the students but the educators in the room too. I would love to videoconference with one of the schools in Brazil my principal visited but I am not sure how much interest there is for purchasing equipment. I couldn't help but think how lucky we are in America to have an agency like NASA to provide programs with such quality science content.